Certain occasions simply call for drinking bubbly: New Year’s Eve, the holiday season between Thanksgiving and New Year’s, a wedding toast, Sunday morning, and of course, Valentine’s Day. The Negroni Sbagliato is a drink that came about by accident but is the perfect, rosy-hued sparkling aperitif to sample this year as you raise a glass to amore. 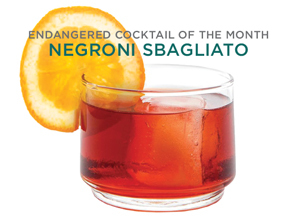 The Negroni Sbagliato is a cousin to the iconic Negroni, which was invented by Count Camilo Negroni in Florence in 1919. It came to be in Milan in 1968, at the busy Bar Basso, where architects and designers crowded the bar at cocktail hour to sample libations mixed by the famous barman Mirko Stocchetto. Born in Venice in 1931, Stocchetto started his career, and the renowned Harry’s Bar, before moving to Milan. He was much-beloved, famous for making precisely balanced and delicious cocktails without ever needing a jigger, and considered a progenitor to the Milan cocktail scene. The Negroni Sbagliato (which translates as “mistaken” or “messed up” Negroni) came to be when, during a busy shift, Stochetto reached for a bottle of Prosecco instead of gin after a barback moved some bottles around on his bar. The guest enjoyed the taste and the drink has been a popular refresher ever since. Stocchetto passed away in 2O16, leaving his business to his son, Maurizio. His legacy lives on in this and the other 1OO or so drinks he invented in his long career in hospitality. Raise a glass to all things heart shaped and to his legacy this Valentine’s Day! BUILD in a double rocks glass with ice.